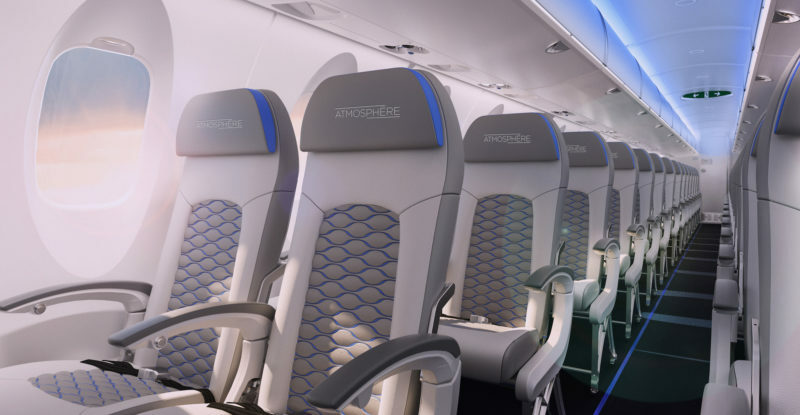 After a dramatic year for the Bombardier C Series, involving the small airliner programme being largely transferred to Airbus’ aegis, the Canadian airframer isn’t resting on its aircraft interiors laurels. It’s back with an updated cabin for the regional workhorse CRJ, which at present is not exactly a passenger favourite. 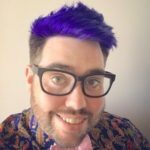 Part of the problem is the small overhead bins, which vice president and head of marketing Patrick Baudis and cabin marketing manager Christine de Gagné readily acknowledged when sitting down with Runway Girl Network to discuss the new cabin. 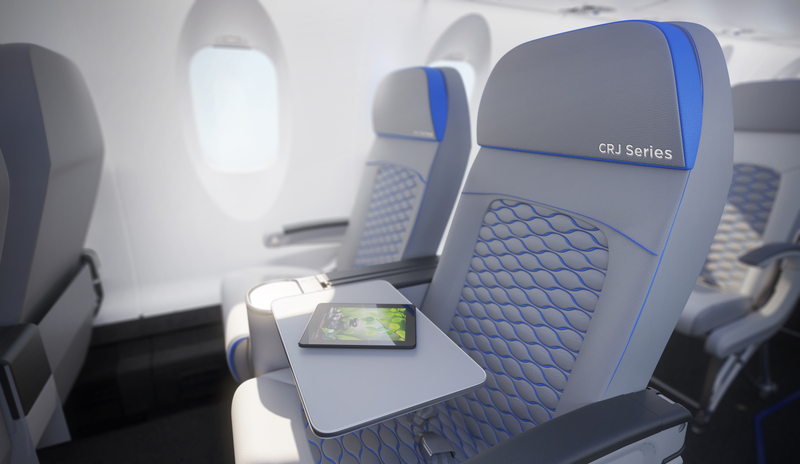 After launching the new Atmosphère CRJ last year, “we have now a great cabin for regional purposes,” Baudis explains. 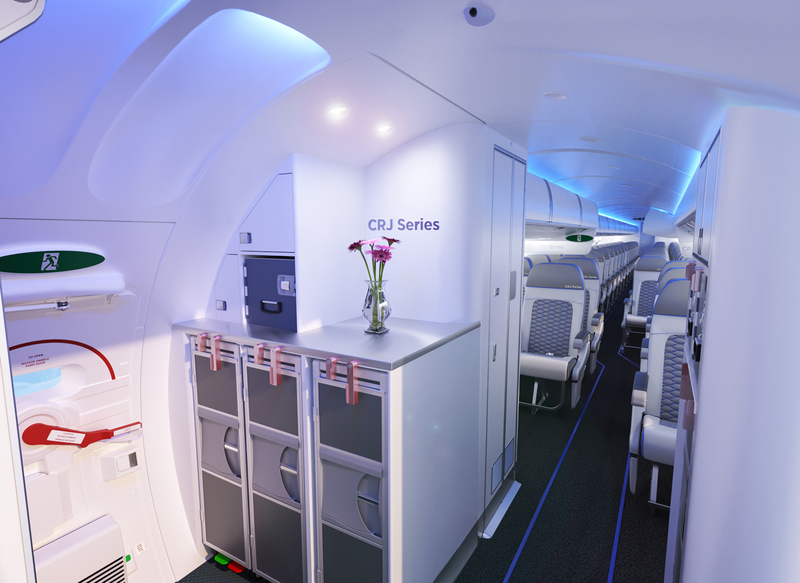 Bombardier brought a futuristic virtual cabin with eye-catching Tron-style graphics to the Aircraft Interiors Expo in Hamburg, in order to demonstrate how it is bringing the knowledge and experience gained with the C Series’ overwhelmingly popular cabin to the CRJ. To start, Bombardier turned its attention to the entrance, a space that is seeing increased focus in both the narrowbody market and on larger airliners. 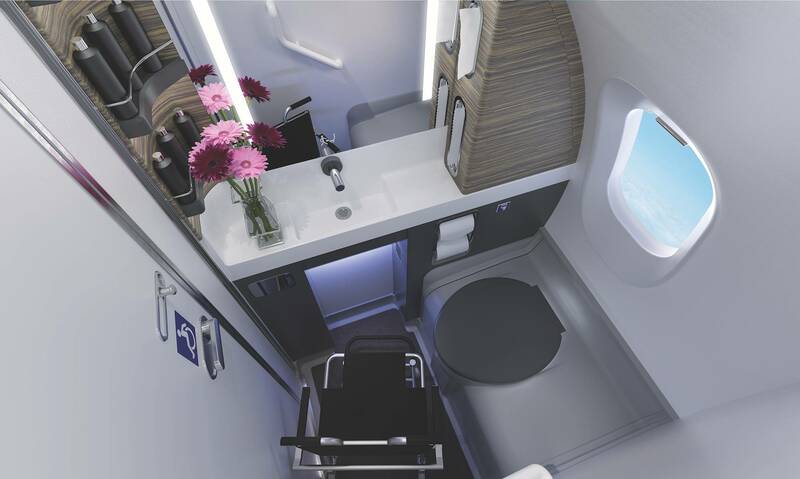 This is the first regional PRM compatible lavatory, Bombardier says, suggesting that it has increased the area of the lavatory by a full 90%, a marked departure from the trend of the latest tiny toilets on board. Further, these lavatories are not just necessary for travellers with mobility restrictions: they serve parents with children, older travellers, people with temporary disabilities, and taller and wider travellers. More bags, too, are a key part of the Atmosphère offer. “Airlines wanted to offer, and passengers want to get, more bags on board. With the regional cross-section and the previous design, we realised we couldn’t optimise this,” Baudis says. 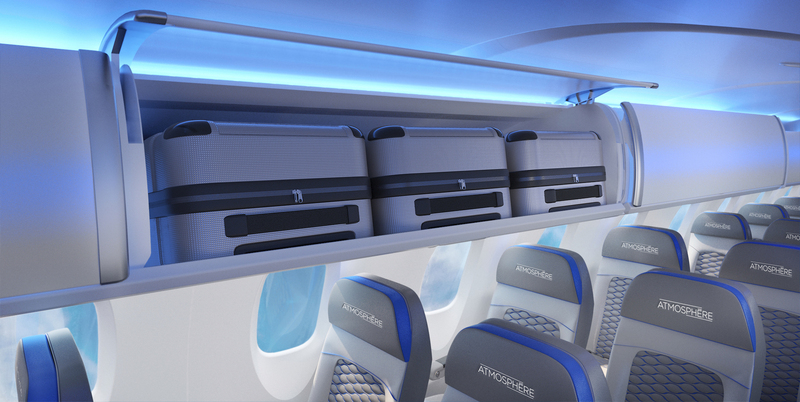 The branded cabin move also positions Bombardier to offer continuity of passenger experience to airlines as passengers move between mainline jets and the regional experience, which can see a marked disparity of PaxEx. As Embraer moves up the size chain with the E-Jet E2 aircraft, the smaller regional jet market is largely left to Bombardier, and in many ways the CRJ struggle is real from a passenger experience point of view. Is a re-cabined jet enough to persuade airlines to buy new regional jets rather than either upgauge to the small airliner market or decide that the increasingly less unpleasant turboprops are a better deal? so I’m a little confused, the original updated design of the overhead bins from last year only allowed wheels first on the wider side of the 2 X 1 business class section, not in the back. did they manage to find a way to go wheels first in the main cabin? that would be a party trick! As a frequent CRJ and q400 passeneger I got one of those 1/2 size underseat roll aboards, sometimes it will fit in the overhead sometimes not, but at least it’s in the cabin with me.